Vegan Documentary Looks Into The Lives Of Vegan Musicians! 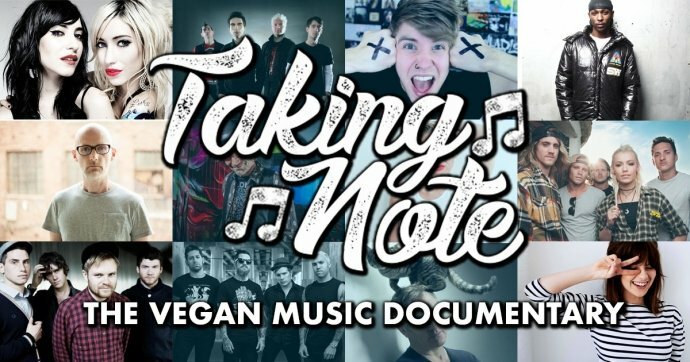 If you have already battered all the documentaries on Netflix and need something new to sink your teeth into, a brand new vegan documentary is on the way that looks into the lives of vegans in the music world. With veganism growing at a dramatic rate over the past 10 years, it’s no surprise that many of our favourite musicians are now adopting a vegan lifestyle to help the animals, the environment or just to get healthy. From Beyonce going plant-based for a quick health kick, Architects joining forces with Sea Shepard to help protect the oceans, to electronic legend Moby creating the soundtrack to the animal rights film ‘Earthlings’ and opening his very own vegan restaurant, Little Pines, veganism has started to affect the music world in more ways than one. With this in mind, a brand new vegan documentary has been in the works since last May by the name ‘Taking Note’ which follows the story of music journalist Chris Hines (HTF Magazine’s Editor), on a journey to discover how veganism has effected musicians and the music scene itself. After watching a video on the album ‘Open Your Eyes’ by Goldfinger called ‘Meet Your Meat’, he instantly started on the path to a vegan lifestyle and now sets out to speak to the musicians themselves to find out how veganism impacted them in the hope their stories will inspire others in the same way. Many more artists are expected to be announced for the documentary in the next few months. The documentary is due for release Winter 2018 and will be premiered exclusively on HTF Magazine. Dark overlord of HTF, Editor/founder Chris runs the website with an iron fist never scared to bash down a rain of anger on his minions. Party Hard!